We are a small family farm located in Southen Indiana, 15 miles south of Corydon to be exact. 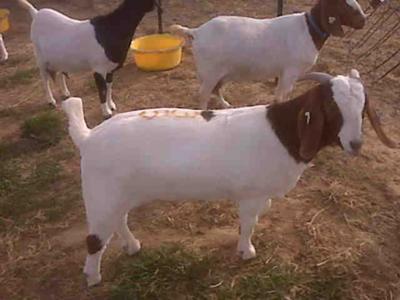 My fiance Kevin has two beautiful boys, Zac and Jesse that started showing boer goats in the local county 4-H in 2002, they fell in love with these animals and the rest is goat history. I met Kevin in February of 2009, just in time to get ready for all the goat madness of the 09' 4-H shows. Diving in head first is not my suggestion for anyone thinking of starting out in farming goats, but it IS how I was initiated to this boer goat family and wouldn't have it any other way. ANYWAY...I have grown to share the love that this family...if not more...has for the BOER GOAT, and look forward to many more years of blood, sweat and tears....and most of all the love these creatures will give back to you when you love them.